If you’re currently using AX 2009 (or even 4.0) and you’ve been waiting for the perfect time to upgrade to a newer version — that time is now. Microsoft Dynamics 365 introduces a bevy of new features (which we’ll get to in a minute) and organizations who are ready to make the switch stand to eliminate a significant amount of costs with a cloud implementation and the reduction of customizations. Not to mention the relief of never having to budget, or implement, a solution ever again. Here’s the important thing: no matter what you call it, deciding to make the move gets you a lot. And that’s just the high-level stuff! Now, let’s say you’ve done your homework and are ready to start your migration. What next? First, you’ll want to evaluate your current customizations and figure out which ones can be retired once you’re able to take advantage of all the features that are now standard in Dynamics 365. Next, you’ll start the long, painful process of migrating all your data over to the new solution...just kidding! Microsoft has already created migration tools that will do a lot of the heavy lifting for you. What does Microsoft’s Migration Tool Include? Configuration and setup: ledger, customer groups, vendor groups, etc. Master data: customer, vendor, project, accounts, etc. Open documents, pending invoices, etc: sales order, purchase order, AR invoices, etc. System Configuration: number sequences, users, user groups, security, etc. Ideally, we wouldn’t recommend migrating historical transactions. But, if you wanted to hang on to them you could leave an instance of the old system running or access the information from a data warehouse. That being said, there are certainly some circumstances where losing this data is not ideal — particularly if you need to access customer order history to take full advantage of being an omnichannel organization. If that’s the case, let’s talk and figure out the best solution for your business. But back to your more standard migrations. The long and short of it is basically anything which has an entity can be migrated to Dynamics 365 with the help of the AX 2009 migration tool. 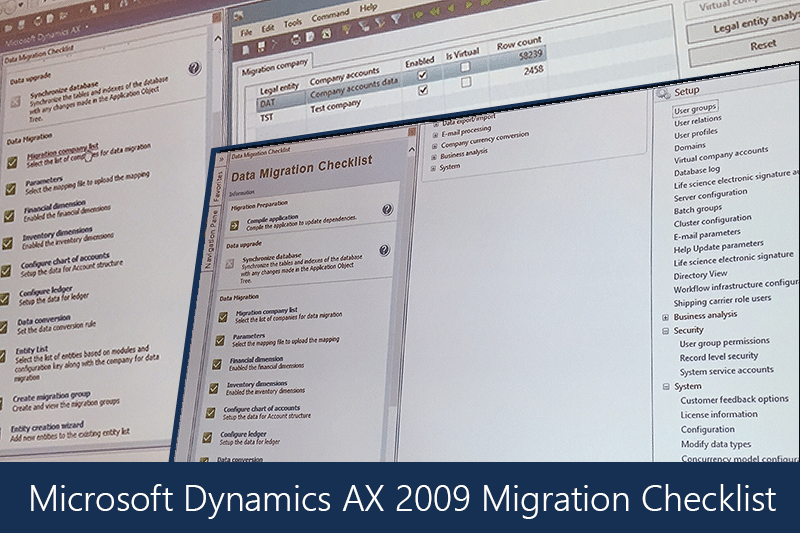 It sits right inside of AX 2009 and provides several solutions to help you through the process — like the included data migration checklist. The checklist provides an easy to follow process which walks you through everything. For instance, during the migration you’ll define data conversion rules and consider how that data might need to transform as part of the move due to data model changes. Within the checklist, you can then easily set which legal entities you’ll include or exclude in the conversion. Here’s a snapshot of what we saw at AXUG 2016 in Tampa. The majority of the time spent on your migration will be defining data entry mappings by module, and whether or not they will be included in the migrations. If that sounds daunting, don’t worry. You don’t have to move the entire system at once. The AX 2009 migration tool lets you chunk up the work by legal entities, data entities, and more. 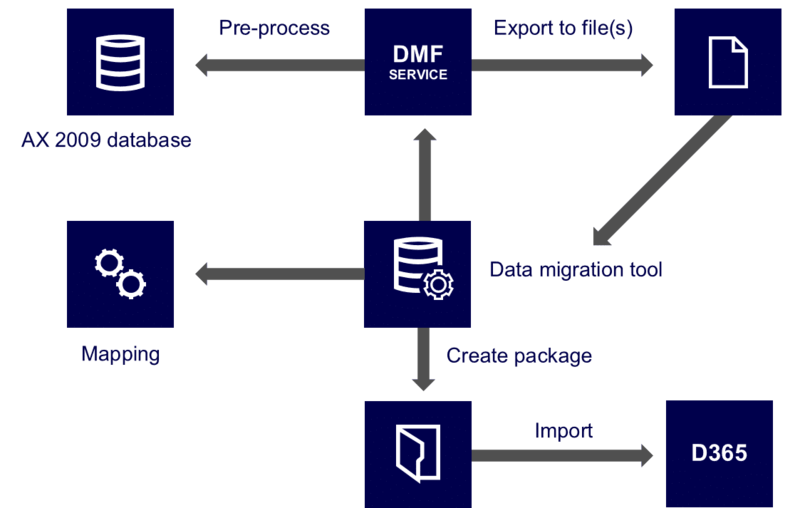 The final steps on your path to Dynamics 365 start with defining the migration groups and the set of entities that will be part of the export package (for instance, maybe start with just a particular customer group). Next, you’ll review the field mappings sources and targets. Then the finale — you click the export button and watch the magic happen. You’ll get a complete package that is ready to smoothly import into Dynamics 365. Rinse and repeat for incremental iterations as needed.